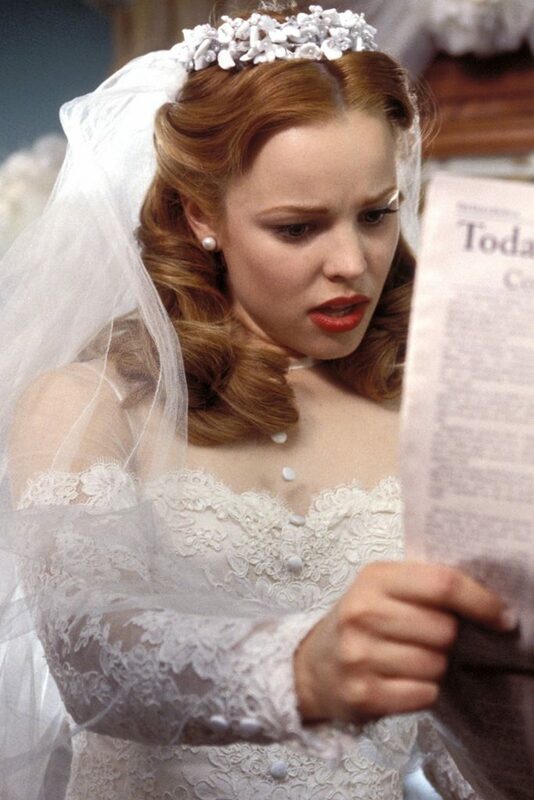 We’ve already covered TV’s best bridal looks—how could we forget the silver screen? 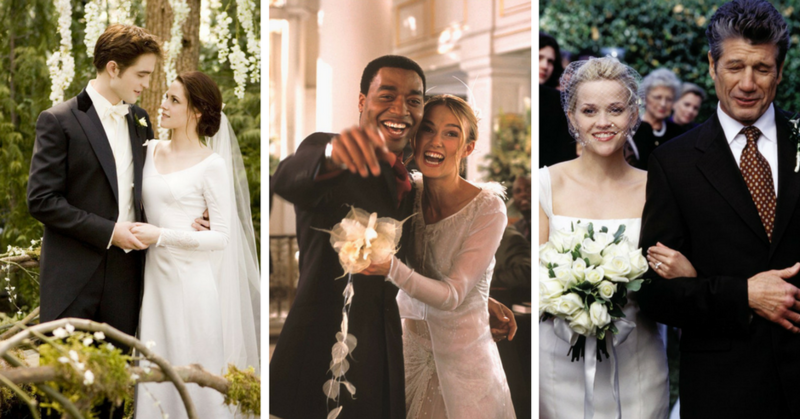 Check out these infamous movie wedding dresses (and see how to recreate the look), below. Considered one of the most iconic movies of all time, The Sound of Music’s wedding scene is just as amazing. Maria’s long sleeve, high neck satin gown is elegant and head-turning. Try this gown if you’re looking for a satin skirt and this one if you prefer body-hugging crepe. While Allie didn’t go through with the wedding (we promise it’s a happy ending) we can’t get over her gorgeous 40s-era gown, complete with high neck illusion, lace long sleeves and buttons down the front of the bodice. For a more accurate match, try this dress, and if you prefer a gown without the illusion neckline, try this. 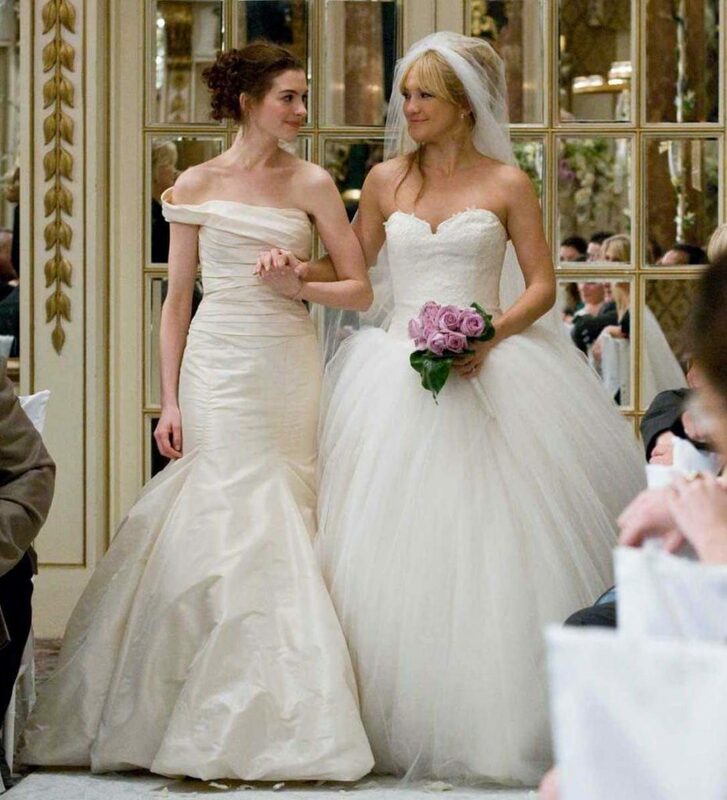 We got not one, but two weddings in Bride Wars—and two gorgeous gowns as well! If you’re loving Anne Hathaway’s one-shoulder mermaid gown, try this. 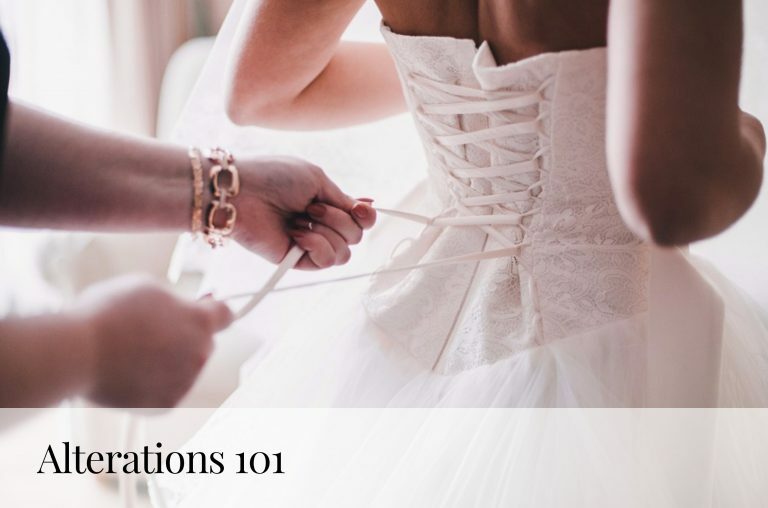 If you’re feeling Kate Hudson’s corset bodice and large tulle skirt ball gown, try this. 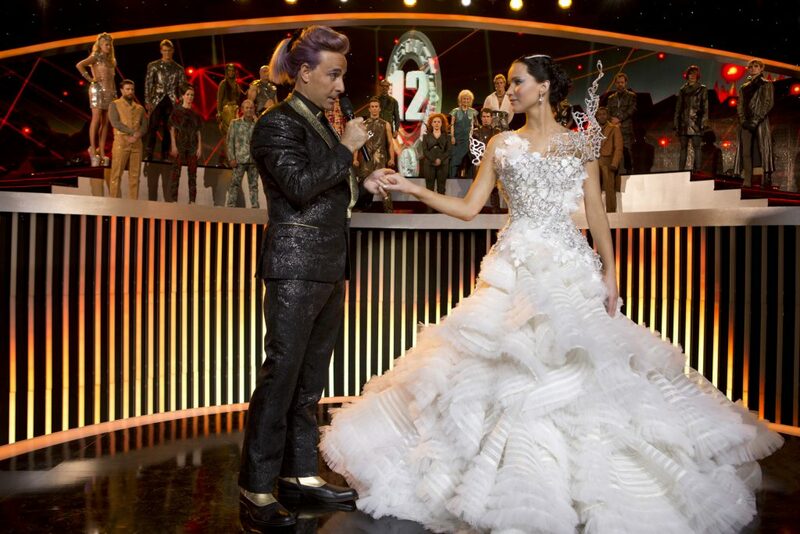 Katniss’s stunning wedding dress in The Hunger Games: Catching Fire blew audiences away—and you can too! Try this gown if you want to match Katniss the most, this dress if you prefer long sleeves, and this dress if you want a detachable skirt! Bella looked classic and elegant in her simple long sleeve v-neck a-line gown and matching veil. If you’re looking for something plain and simple like Bella, try this dress, and if you want to spice it up with a little lace illusion, try this. Raise your hand if you’re as obsessed with My Big Fat Greek Wedding as we are. Big families, big hair and a big gown are all present in this movie. Because she was married in a Greek Orthodox Church, Toula went this a ¾ sleeve v-neck ball gown with lace and embroidery throughout. Looking for a church-approved look like her’s? Try this and this. 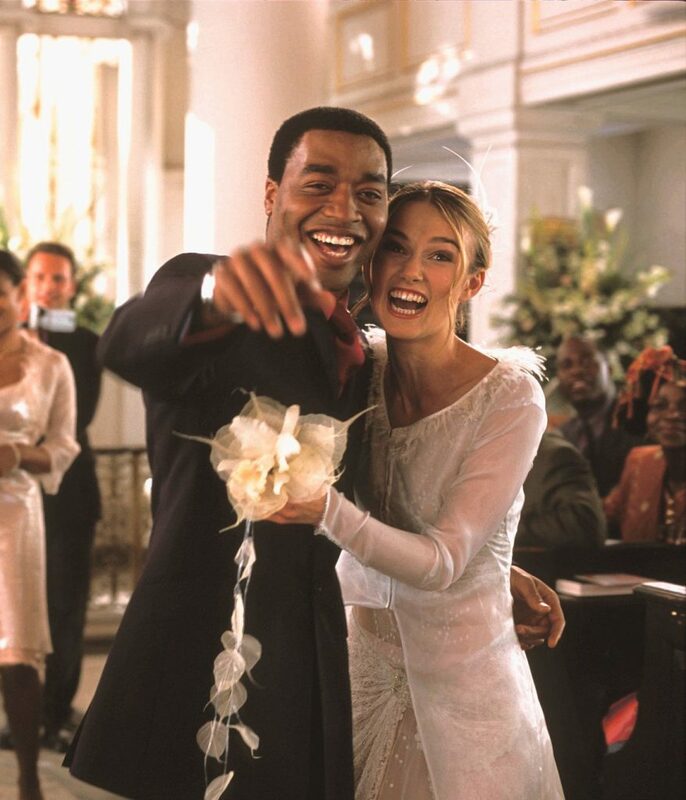 While it’s nearly impossible to copy Keira Knightley’s outfit in Love Actually (she’s wearing a custom crop top, skirt and overshirt) there’s definitely ways to copy her bohemian, ethereal, laid-back bridal look for your wedding day. If you like the slim-fit sheath aspect of her look, try this. If you’re looking for a two piece wedding dress, try this. If you love the idea of an overshirt, try this dress with added capelet. 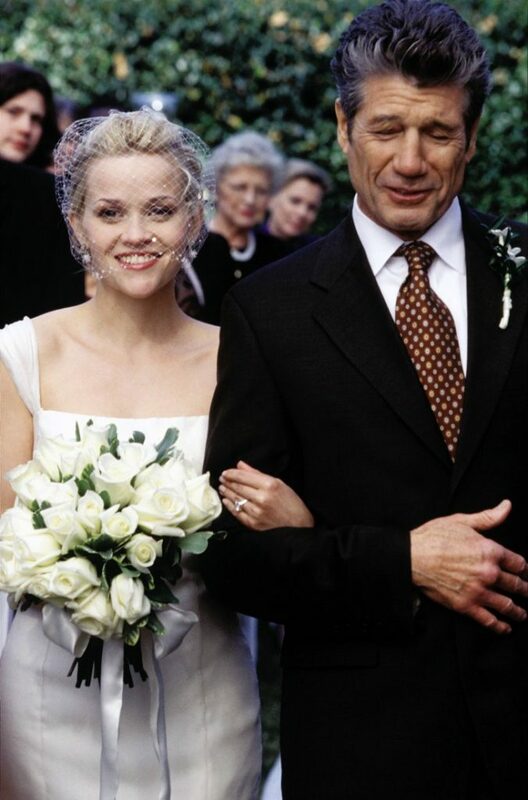 We love Reese Witherspoon’s simple and chic wedding dress with cap sleeves and fit and flare silhouette, complete with birdcage headpiece. Try this or this to copy her look on your wedding day. 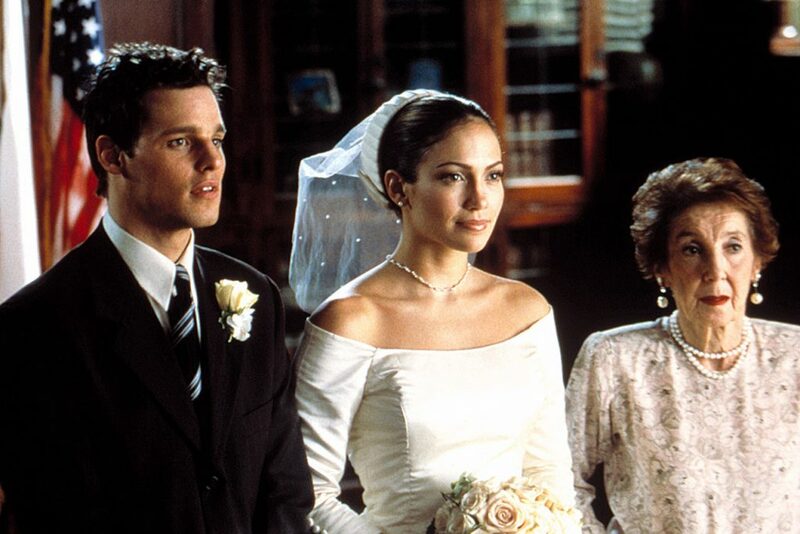 While Mary’s (Jennifer Lopez) wedding didn’t end up happening, her bridal look is timeless, stunning and perfect for a classic wedding. We love her long sleeve, off-the-shoulder satin sheath dress—try this, this, or this to recreate the look. How could anyone forget this iconic moment in SATC history. 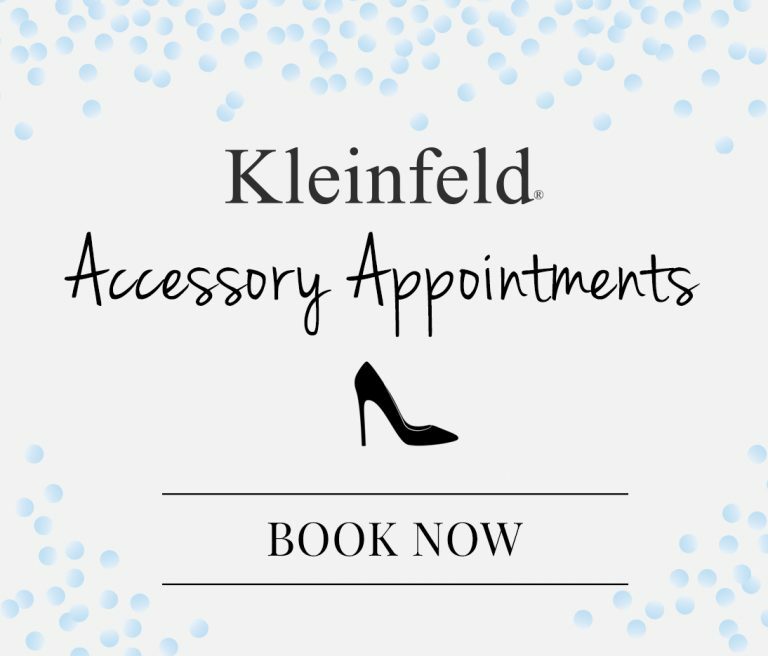 Carrie Bradshaw wore Vivienne Westwood Couture on her wedding day—luckily for you, we carry this designer right here at Kleinfeld! While no one can duplicate SJP’s look exactly, you can channel your inner Carrie in a strapless ballgown with sweetheart neckline and ruffled skirt on any budget—here, here, here and here. To check availability for Vivienne Westwood gowns, please call our store. The best of the best, in our opinion. 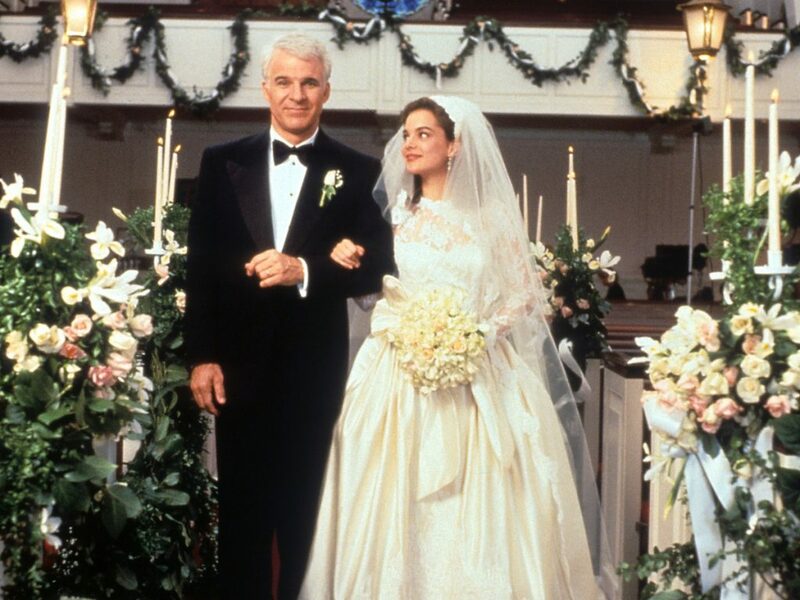 A true classic, the wedding in Father of the Bride has been known as one of the most iconic (and expensive) on-screen weddings. We love the lace high neck illusion long sleeve ball gown Annie is wearing—copy her classic and elegant look in this, this or this. To all you millennials out there, you know all about Princess Mia Thermopolis, of Princess Diaries. 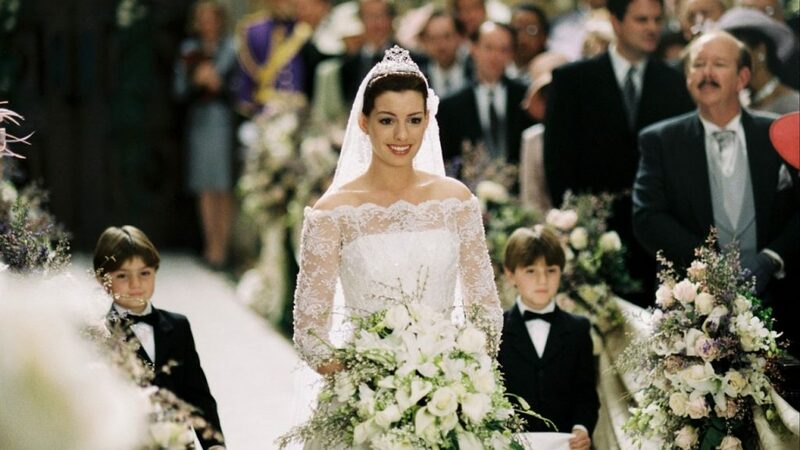 In the sequel, she walks down the aisle to be crowned Queen, channeling her inner Grace Kelly. We love the off-the-shoulder lace illusion long sleeved ball gown she wore down the aisle—and we carry almost a perfect match! Love these gowns but want to see more! Check out our dress gallery! 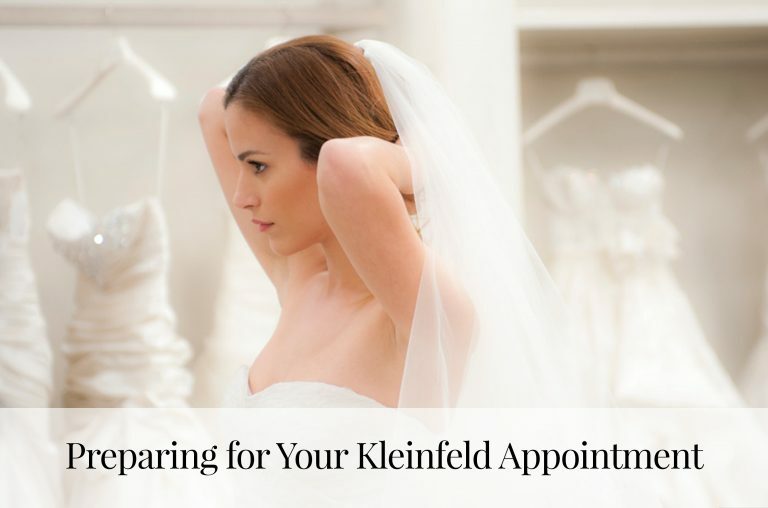 Once you’ve picked some favorites, go ahead and make an appointment!